Home/Uncategorised/Will Western Canadian natural gas producers be affected by U.S. shale production? The shale revolution has diversified North America’s gas markets. Good news for Ontario’s Dawn trading hub, but WCSB producers may have little cause to cheer. Simply put, two macro drivers driving change at Dawn stem from the shale gas revolution and the Athabasca oil sands. On the shale side, the ramp-up in production from low-permeability shale basins such as the Marcellus mean pipeline infrastructure is getting built or re-purposed to better mediate shifting production and demand in the integrated continental gas marketplace. Natural gas trade volumes are changing and flow is reversing in various places. Alberta’s oil sands sector is likewise effecting change at the faraway Dawn hub. In situ and mining oil sands operators, with their gas-intensive thermal production, upgrading processes and use of natural gas condensate to dilute bitumen for transport are increasing gas demand in the west. This demand, in conjunction with chronically depressed gas prices, has led TransCanada Corp. to repurpose part of its mainline for oil shipment as part of its Energy East project. The planned conversion will diminish the mainline’s transport capacity for eastbound gas by about 1 billion cubic feet per day. Dawn draws long haul supplies from Western Canadian gas fields and from across the entire United States, including the Gulf of Mexico and major shale plays. Its trading activity, whether electronic platform-based or over-the-counter, generate made-in-Ontario gas prices, meaning Dawn prices broadly reflect North American gas supply fundamentals meeting eastern Canadian and northeastern American gas demand. Of the 40-odd North American market centers where natural gas is physically traded, Dawn counts as the third-largest. One-hundred counter parties trade regularly in a forum with 5.5 billion cubic feet per day of send-out capacity – roughly five per cent of peak North American demand, says Libby Passmore, a spokesperson from Union Gas, subsidiary of midstream conglomerate Spectra Energy Corp and operator of Dawn. The history of the Dawn hub stretches back to the Second World War. With 23 depleted gas pools in southwestern Ontario providing the geological storage, it originally opened in 1942 as a containment facility for off-gas, a byproduct of crude oil processing from Imperial Oil’s Sarnia refinery. 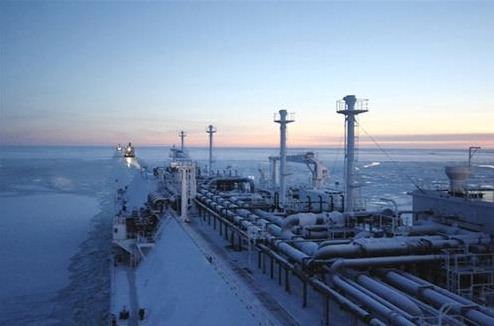 Its operator, Union Gas, also received American natural gas imports during the war and Dawn has continued to function as a bi-national storage and trading hub ever since. TransCanada Corp.’s mainline pipeline, initiated while Louis St. Laurent sat in the Prime Minister’s office but completed in 1958 during the early Diefenbaker years, was the means of eventually bringing western Canadian gas to Ontario and Quebec. The completion in 1967 of the company’s part-owned U.S.-transiting pipeline, the Great Lakes Transmission System (GLTS), contributed further to Dawn’s role as a receiving station for WCSB gas. According to the National Energy Board (NEB, 2013), the remaining marketable natural gas resources in Canada are 1,093 trillion cubic feet largely owing to enormous new unconventional reserve contributions in the western provinces. In the wake of the recent global recession and the shale gas boom, producers have, however, put the brakes to Western Canadian gas drilling. So despite dramatically increasingly reserves, mainline shipments from the Alberta-Saskatchewan border to Ontario have dropped by four billion cubic feet per day since 2006, according to the Alberta Energy Regulator. TransCanada’s application to the NEB for a change in the mainline’s tolling levels was necessary to achieve returns on equity sufficient to make the system sustainable on a go-forward basis. The tolling system needed to be revised to account for greater competition in a market where end use customers now had a variety of supply options. The NEB accepted TransCanada’s application for a lowering of the line’s toll levels in 2013, fixing the 100 per cent load factor for the Empress (Alberta)-to-Dawn path at $1.42 per gigajoule from $2.58/GJ until 2017. Subsequent to the revision of the tolling regime, TransCanada floated the $12-billion Energy East project that involves the partial repurposing of the mainline transport capacity to ship up to 1.1 million barrels per day of diluted oil sands product to eastern refining and tidewater export facilities. The gas-to-oil repurposing envisioned by the project involves conversion of about 3,000 kilometers of 42-inch diameter pipeline between Alberta and Cornwall, Ontario – in other words, one of the six pipes in the mainline system – and the laying of another 1,500 through to New Brunswick. n 2005, geologists were still largely dismissive of the Marcellus’s potential in light of its technically intractable reservoir characteristics. By 2008, quantum leaps in directional drilling and hydraulic fracturing techniques forced a re-evaluation of the potential of hydrocarbon-soaked shale and sandstone formations worldwide. Geotechnically-speaking, the Marcellus is today no longer an ugly duckling, but a golden goose. Some have even jokingly referred to it as the “Ghawar of gas”, owing to its critical role in turning the United States from energy security worrywart into the world’s top dog gas producer. Located in the straddle zone between Central Canadian and New England population demand hubs, Marcellus shale enjoys a significant competitive advantage over Western Canadian gas. As Marcellus supplies gradually integrate into the Eastern seaboard’s pipeline grid, its locational advantage enables it to displace gas from more remote sources that incur greater transportation and fuel costs. With the reversal of the Niagara/Chippawa to Kirkwall pipeline and other new pipeline projects, American gas imports could potentially increase to 2 bcf/d. One of the developments is Houston-based Spectra Energy Corp.’s (and Union Gas’s parent company) proposed a 400-kilometer, $1.5 billion pipeline link, the Nexus Gas Transmission, from Ohio’s Utica Shale with partners Enbridge Inc. and DTE Energy. Meeting the Vector Pipeline, the Nexus would then transmit one billion cubic feet per day to Dawn. The liquids-rich Utica Shale lies several thousand feet under much of the Marcellus in parts of Ohio, Pennsylvania, West Virginia, New York and Quebec. The U.S. Geological Survey’s estimates the Utica’s undiscovered, technically recoverable unconventional resources at 38 trillion cubic feet for natural gas, 208 million barrels for natural gas liquids and 940 million barrels of for oil. Development in the deeper Utica is still early days, but like the Marcellus this play also has the potential to disrupt the traditional gas supply situation in Ontario and Quebec. Availability of WCSB supplies for Dawn may, however, decline naturally as western producers increasingly shift from dry gas production to economically more attractive liquids-rich plays as the produced natural gas liquids sell briskly in western markets to oil sands and petrochemical industries. Quebec may also heat up the competition for space at Dawn should the provincial government finally open up exploration and development on Anticosti Island. Recent announcements coming from Quebec City suggest the province’s fracking moratorium is showing cracks. And competition is also coming from even further westward with the rapidly emerging shale plays in British Columbia such as the Horn River, Montney, Liard and Cordova Embayment whose production is entering the Nova gas transmission system and supplementing the traditional WCSB Dawn-bound supplies. But the $64,000 question is whether the much ballyhooed LNG industry in North America finally does take off. There are over a dozen LNG proposals on the drawing board in British Columbia, seven of which have cleared the permitting phase. And then there is India’s H-Energy plans for an LNG export facility in Goldboro, Nova Scotia that would tie up 1.5 bcf/d of feedstock gas from the Marcellus via Spectra Energy Corp’s Maritimes and Northeast Pipeline. It appears likely that at least two or three of these facilities will come to fruition and their knock-on effect, combined with that from U.S. LNG projects, will have effects that will ripple through to both Western Canadian producers and their Ontario-bound gas shipments.